The main aim given to students was to make a copy of the Canadian website named BOLD (Barcode Of Life Data Systems). This website contains the records of all the barcoded species i.e, their sequence record, basic info, taxonomy, collection & Location, imagery and all such records. DNA barcoding is a taxonomic method that uses a short genetic marker in an organism’s DNA to identify it as belonging to a particular species. During our internship I have worked on designing a database using different software techniques. Before starting to work on website. I first learned different aspects which was helpful in making of the website. HOW TO CREATE TABLES IN SQL SERVER? The CREATE TABLE statement is used to create a new table in a database. In SSMS, in Object Explorer, connect to the instance of Database Engine that contains the database to be modified. In Object Explorer, expand the Databases node and then expand the database that will contain the new table. In Object Explorer, right-click the Tables node of your database and then click New Table. Type column names, choose data types, and choose whether to allow nulls for each column as shown in the following illustration. To specify more properties for a column, such as identity or computed column values, click the column and in the column properties tab, choose the appropriate properties. For more information about column properties, see Table Column Properties (SQL Server Management Studio). To specify a column as a primary key, right-click the column and select Set Primary Key. For more information, see Create Primary Keys. To create foreign key relationships, check constraints, or indexes, right-click in the Table Designer pane and select an object from the list as shown in the following illustration. 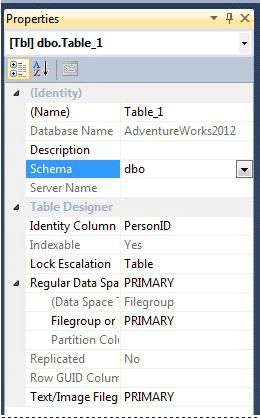 By default, the table is contained in the dbo schema. To specify a different schema for the table, right-click in the Table Designer pane and select Properties as shown in the following illustration. From the Schema drop-down list, select the appropriate schema. From the File menu, choose save table name. In the Choose Name dialog box, type a name for the table and click OK.
To view the new table, in Object Explorer, expand the Tables node and press F5 to refresh the list of objects. The new table is displayed in the list of tables. An entity relationship diagram (ERD) shows the relationships of entity sets stored in a database. An entity in this context is a component of data. In other words, ER diagrams illustrate the logical structure of databases. Choose and expand your Database. Under your database right click on “Database Diagrams” and select “New Database Diagram”. 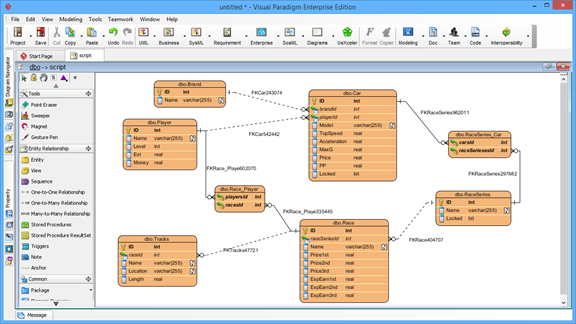 Database Normalization is a technique of organizing the data in the database. Normalization is a systematic approach of decomposing tables to eliminate data redundancy and undesirable characteristics like Insertion, Update and Deletion Anomalies. It is a multi-step process that puts data into tabular form by removing duplicated data from the relation tables. Ensuring data dependencies make sense i.e data is logically stored. Without Normalization, it becomes difficult to handle and update the database, without facing data loss. Insertion, Updation and Deletion Anamolies are very frequent if Database is not Normalized. Normalization rule are divided into following normal form. As per First Normal Form, no two Rows of data must contain repeating group of information i.e each set of column must have a unique value, such that multiple columns cannot be used to fetch the same row. Each table should be organized into rows, and each row should have a primary key that distinguishes it as unique. The Primary key is usually a single column, but sometimes more than one column can be combined to create a single primary key. As per the Second Normal Form there must not be any partial dependency of any column on primary key. It means that for a table that has concatenated primary key, each column in the table that is not part of the primary key must depend upon the entire concatenated key for its existence. If any column depends only on one part of the concatenated key, then the table fails Second normal form. Amount of data duplication is reduced. And, for each functional dependency ( X -> Y ), X should be a super Key. 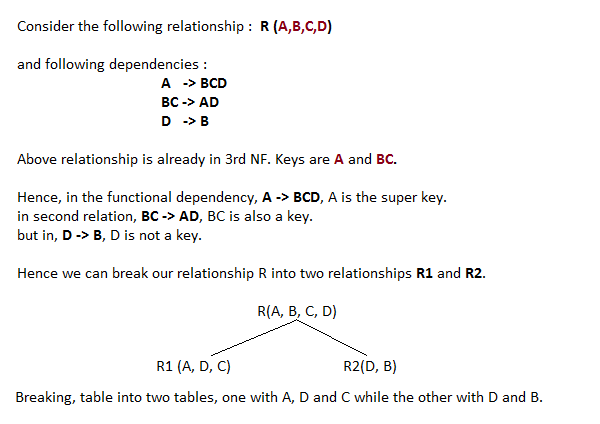 A primary key, also called a primary keyword, is a key in a relational database that is unique for each record. It is a unique identifier. In the context of relational databases, a foreign key is a field (or collection of fields) in one table that uniquely identifies a row of another table or the same table. In this part of the walk-through, you will create a Web site project and add a new page to it. You will also add HTML text and run the page in your Web browser. If you have already created a Web Forms Web site project in Visual Studio (for example, by following the steps in Walk-through: Creating a Basic Web Forms Page in Visual Studio), you can use that Web site and skip to “Creating a New Page” later in this walk-through. Otherwise, create a new Web site project and page by following these steps. Open Visual Studio or Visual Web Developer Express. Under Installed Templates, click Visual Basic or Visual C# and then select ASP.NET Web Site. In the Web location box, select File System, and then enter the name of the folder where you want to keep the pages for your Web site. For example, type the folder name C:\WebSites. When you create a new Web site project, Visual Studio adds a Web Forms page named Default.aspx. By default, Visual Studio creates a page with code separation. Close the Default.aspx page. To do this, right-click the tab with the file name in it and then click Close. In Solution Explorer, right-click the Web site (for example, C:\BasicWebSite) and then click Add New Item. Under Installed Templates, click Visual Basic or Visual C# and then select Web Form from the list. In the Name box, enter WebPageSeparated. Make sure that the Place code in separate file check box is selected. Make sure that the Select master page check box is cleared. For this walk-through, you will create a page that does not use the master page that is included in the Web site project. Visual Studio creates two files. The first file, WebPageSeparated.aspx, will contain the page’s text and controls, and is opened in the editor. A second file, WebPageSeparated.aspx.vb or WebPageSeparated.aspx.cs (depending on what programming language you selected), is the code file. You can see both files in Solution Explorer by clicking the plus sign (+) next to the WebPageSeparated.aspx file; the code file has been created but is not open. You will open it later in the walk-through when you write code. In this part of the walk-through, you will add some static HTML text to the WebPageSeparated.aspx page. Click the Design tab at the bottom of the document window to switch to Design view. Design view displays the page you are working on in a WYSIWYG-like way. At this point, you do not have any text or controls on the page, so the page is blank. Place the insertion pointer in the div element that is already on the page. Type the words Welcome to Visual Studio Using Code Separation. You can see the HTML that you created by typing in Design view. At this stage, the page looks like an ordinary HTML page. The only difference is in the <%@ Page %> directive at the top of the page. In this part of the walkthrough, you will add server controls to the Web Forms page: a button, text box, and label control. You will also write code to handle the button’s Click event. Server controls, which include buttons, labels, text boxes, and other familiar controls, provide typical form-processing capabilities for your ASP.NET Web Forms pages. However, you can program the controls with code that runs on the server, not the client. Place the insertion pointer after the text that you added previously. Press ENTER a few times to make some room. From the Standard tab in the Toolbox, drag three controls onto the page: a TextBox control, a Button control, and a Label control. Put the insertion pointer in front of the text box and type Enter your name:. This static HTML text is the caption for the TextBox control. You can mix static HTML and server controls on the same page. Visual Studio offers you various ways to set the properties of server controls on the page. In this part of the walk-through, you will work with properties in both Design view and Source view. Select the Button control and in the Properties window set its Text property to Display Name. Source view displays the HTML markup for the page, including the elements that Visual Studio has created for the server controls. Server controls are declared using HTML-like syntax, except that the tags use the prefix asp: and include the attribute runat=”server”. Server control properties are declared as attributes. For example, when you set the button’s Text property in Step 1, you were actually setting the Text attribute in the control’s markup. Note that all the controls are inside a form element that also has the attribute runat=”server”. The runat=”server” attribute and the asp: prefix for control tags mark the controls so that they are processed by ASP.NET when the page runs. For this walk-through, you will write code that reads the name that the user enters in the text box and then displays it in the Label control. Visual Studio opens the WebPageSeparated.aspx.vb or WebPageSeparated.aspx.cs file in a separate window in the editor. The file contains a skeleton Click event handler for the button. Complete the Click event handler by adding the following highlighted code. When you create ASP.NET Web Forms pages and write code in them, you can select from two models for how to manage the visible elements (controls and text) and your programming code. In the single-file model, the visible elements and code are kept together in the same file. In the alternative model, called “code separation,” the visible elements are in one file and the code is in another file, referred to as the “code-behind” file. This walkthrough introduces you to Web Forms pages that use code separation. The single-file model is introduced in Walkthrough: Creating a Basic Web Forms Page in Visual Studio. The walkthrough you are reading now shows you how to create a Web page with the same functionality as the page in the single-file walkthrough, but with a focus on using code separation. The choice between using single-file pages and pages with code separation is primarily one of convenience and personal preference. Working with both models in Microsoft Visual Studio is similar; both models have approximately equal support in the editor. Both models have equivalent performance when the page runs. The page with code separation makes it more practical to let a Web designer work on the layout of a page while a programmer creates the code for the page, because the two pages can be edited separately. Creating an ASP.NET Web Forms page with code separation. Running pages with the Visual Studio Development Server. Visual Studio or Visual Web Developer Express. If you have already created a Web Forms Web site project in Visual Studio (for example, by following the steps in Walkthrough: Creating a Basic Web Forms Page in Visual Studio), you can use that Web site and skip to “Creating a New Page” later in this walkthrough. Otherwise, create a new Web site project and page by following these steps. Visual Studio creates a Web site project that includes prebuilt functionality for layout (a master page, the Default.aspx and About.aspx content pages, and a cascading style sheet), for Ajax (client script files), and for authentication (ASP.NET membership). For this walkthrough, you will create a page that does not use the master page that is included in the Web site project. Visual Studio creates two files. The first file, WebPageSeparated.aspx, will contain the page’s text and controls, and is opened in the editor. A second file, WebPageSeparated.aspx.vb or WebPageSeparated.aspx.cs (depending on what programming language you selected), is the code file. You can see both files in Solution Explorer by clicking the plus sign (+) next to the WebPageSeparated.aspx file; the code file has been created but is not open. You will open it later in the walkthrough when you write code. In this part of the walkthrough, you will add some static HTML text to the WebPageSeparated.aspx page. Click the Design tab at the bottom of the document window to switch to Design view. Design view displays the page you are working on in a WYSIWYG-like way. At this point, you do not have any text or controls on the page, so the page is blank. You now have two files that make up the complete Web Forms page named WebPageSeparated: WebPageSeparated.aspx and WebPageSeparated.aspx.vb or WebPageSeparated.aspx.cs. In this section of the walkthrough, you will examine how these files are structured and how they relate to each other. Click the WebPageSeparated.aspx tab at the top of the editor window to switch to the page file. When the page runs, ASP.NET dynamically creates an instance of a class representing the Web Forms page. The Inherits attribute identifies the class defined in the code-behind file from which the .aspx page is derived. By default, Visual Studio uses the page name as the basis for the class name in the code-behind file. The Code File attribute identifies the code file for this page. In simple terms, the code-behind file contains the event-handling code for your page. Click the WebPageSeparated.aspx.vb or WebPageSeparated.aspx.cs tab to switch to the code file. The code file contains code that is similar to a class definition. However, it is not a complete class definition; instead, it is a partial class that contains only a portion of the complete class that will make up the page. Specifically, the partial class defined in the code file contains the event handlers and other custom code that you write. At run time, ASP.NET generates another partial class containing your user code. This complete class is then used as the base class that is used to render the page. For more information, see ASP.NET Page Class Overview. The page runs using the Visual Studio Development Server. Enter a name in the text box and click the button. The name you entered is displayed in the Label control. ASP.net s the language used for my website. The two main languages targetting .Net are C# and VB.Net. ASP.Net is an extension to the provided .Net library to enable applications written in C# or VB.Net (or other .Net targetted languages) to work as a website. ASP.NET Web Forms is a part of the ASP.NET web application framework and is included with Visual Studio. It is one of the four programming models you can use to create ASP.NET web applications, the others are ASP.NET MVC, ASP.NET Web Pages, and ASP.NET Single Page Applications. Web Forms are pages that your users request using their browser. These pages can be written using a combination of HTML, client-script, server controls, and server code. When users request a page, it is compiled and executed on the server by the framework, and then the framework generates the HTML markup that the browser can render. An ASP.NET Web Forms page presents information to the user in any browser or client device. WHAT IS THE USE OF MASTERPAGE IN ASP.NET? ASP.NET master pages allow you to create a consistent layout for the pages in your application. A single master page defines the look and feel and standard behavior that you want for all of the pages (or a group of pages) in your application. ASP is a file extension for the Active Server Page file format used by an HTML file containing a Microsoft server-processed script. An ASP files‘ scripts are processed on a Microsoft Web server before the page is sent to the user, usually tailoring a page for the user. How can we create master page in asp net? To create the master page**In Solution Explorer, right-click the name of your Web site, and then click Add New Item. **Under Visual Studio installed templates, click Master Page. **In the Name box, type Master1. **Select the Place code in separate file check box. What is MVC in asp net? ASP.NET supports three major development models: Web Pages, Web Forms and MVC (Model View Controller). The ASP.NET MVC framework is a lightweight, highly testable presentation framework that is integrated with existing ASP.NET features, such as master pages, authentication, etc. C# (pronounced “C-sharp”) is an object-oriented programming language from Microsoft that aims to combine the computing power of C++ with the programming ease of Visual Basic. C# is based on C++ and contains features similar to those of Java. C# is designed to work with Microsoft’s .Net platform. This is basically the Canadian website I have been working on. I have made a copy of this website in order to learn the basics of bioinformatics. This system contains all the records of the species, their barcoded data, sequences, taxonomical information and their images as well. 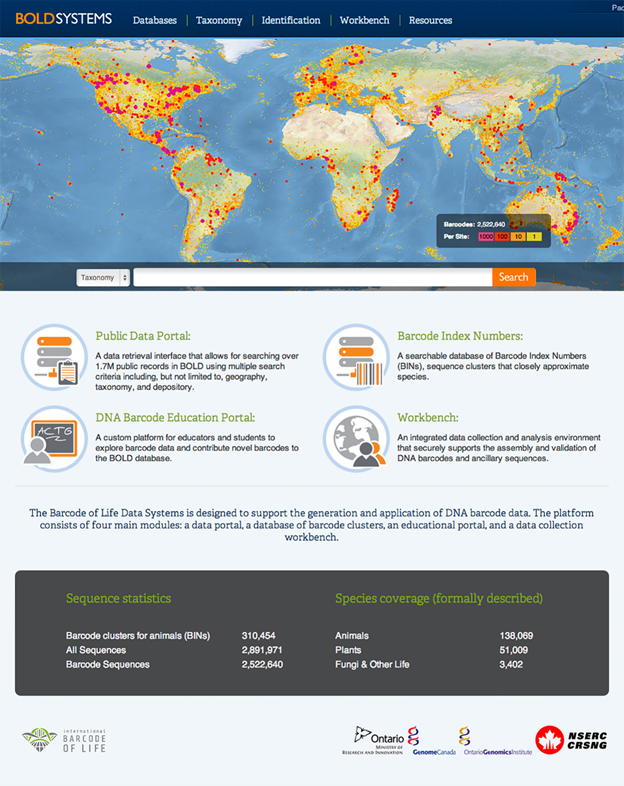 The Barcode of Life Data Systems (BOLD) is a web platform that provides an integrated environment for the assembly and use of DNA barcode data. It delivers an online database for the collection and management of specimen, distributional, and molecular data as well as analytical tools to support their validation. Since its launch in 2005, BOLD has been extended to provide a range of functionality including data organization, validation, visualization and publication. The most recent version of the system, launched in October 2013, brings a collection of iterative improvements supporting data collection and analysis but also includes novel modules improving data dissemination, citation, and annotation. 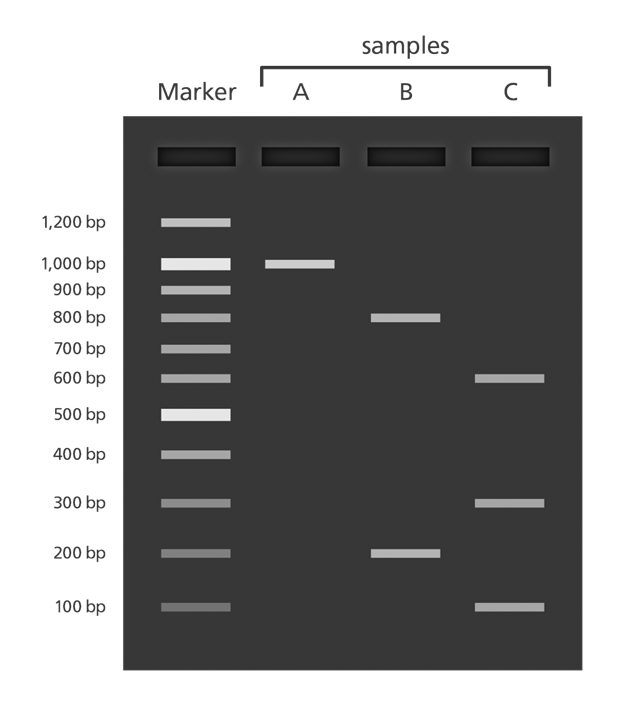 BOLD is freely available to any researcher with interests in DNA Barcoding. By providing specialized services, it aids in the publication of records that meet the standards needed to gain BARCODE designation in the international nucleotide sequence databases. Because of its web-based delivery and flexible data security model, it is also well positioned to support projects that involve broad research alliances. This documentation provides details on BOLD functionality, data structures, and best practices. It explains how to use this system to collect, manage, and publish Barcode and ancillary data. It also provides details on BOLD integrated analytical tools and how to validate barcode data. Users can search keywords to quickly find relevant handbook pages using the search bar at the top of the left side. The BOLD platform is comprised of a set of integrated databases. 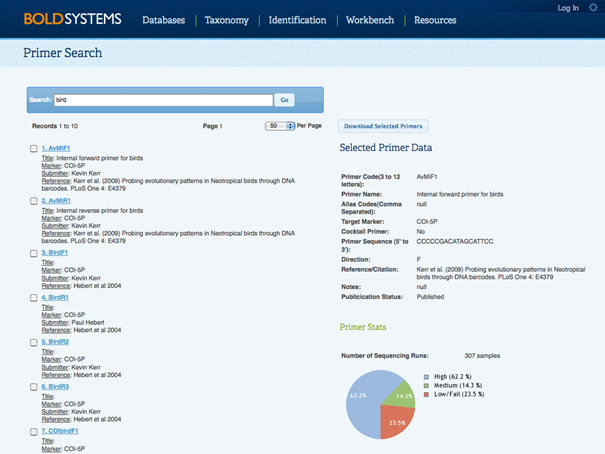 The Public Data Portal supports queries based on taxonomy (scientific names only), geography, attribution fields (i.e. 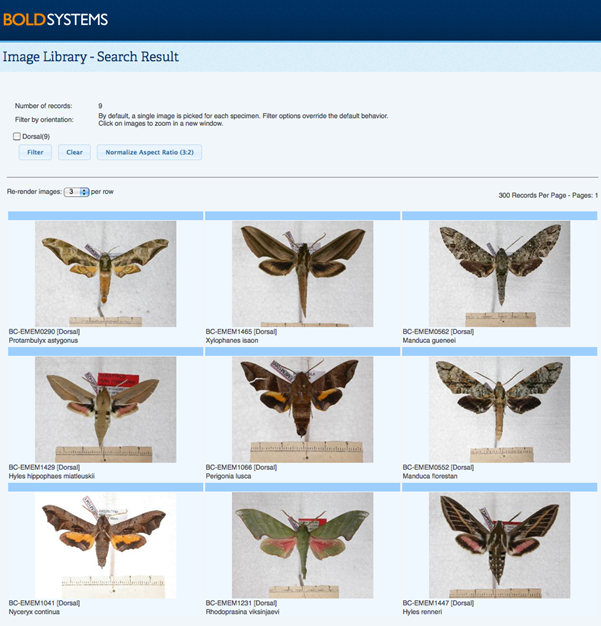 collectors and taxonomists), specimen depositories, project or dataset codes, specimen and sequence identifiers (sample ids, museum ids, processed, etc). Free text searches are allowed, the system will try to extract meaningful terms from the search. A searchable database of Barcode Index Numbers (BINs), sequence clusters that closely approximate species. This system allows for rapid validation and use of barcode data where taxonomic data are lacking or unverified. A collection of barcode publications and publications that have utilized barcode records. Data of various families are included in it i.e, plants, protists, animals, fungi. Public record barcode database or full length barcode database. 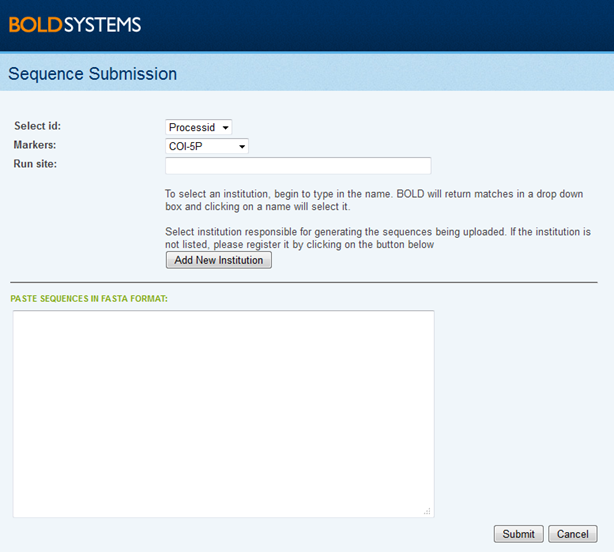 Sequences are submitted in fasta format. DNA isolation is a process of purification of DNA from sample using a combination of physical and chemical methods. The first isolation of DNA was done in 1869 by Friedrich Miescher. Currently it is a routine procedure in molecular biology or forensic analyses. Once the sample is prepared add 300 µL EBA, 900µl EBB, and 100 µl SDS. Vortex and incubate at 65o C for 10 min. Place tube on ice and add 410 µL cold potassium acetate. Mix by inversion and place tube back on ice for 3 min. Transfer 1 mL of the supernatant to a new 1.5 mL microcentrifuge tube, add 540 µL of ice cold absolute isopropanol, and incubate in ice for 20 min. Resuspend the dry pellet in 600 µL of TE. Add 60 µL 3M sodium acetate (pH 5.2) and 360 µL ice cold absolute isopropanol. Incubate on ice for 20 min. Resuspend the pellet in 50 µL TE and carry out agarose gel QC. Agarose Gel QC 1. Cast a 1.0% (w/v) regular agarose gel in 1X TBE 2. Place 5 µL of extracted DNA and 5 µL sterile water in a 0.2 mL microcentrifuge tube along with 2 µL of gel tracking dye. 3. Run the gel for 20 min. at 100v. 4. Stain gel and view result. PCR QC Obtaining what appears to be good high molecular weight genomic is only the first line of QC for this protocol. 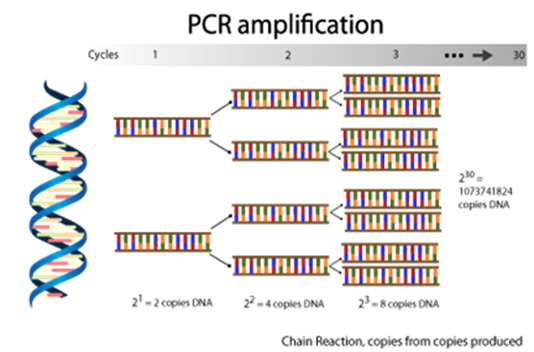 The ultimate test is to see if the DNA can be used to amplify a Genomic DNA PCR product. The test case used in developing this protocol was leaf tissue from the coleus plant (Coleus blumei). In order to test the DNA for PCR amplification the gene encoding tyrosine aminotransferase (GenBank #AJ458993) was submitted for PCR primer selection using the IDT SciTools software PrimerQuest. 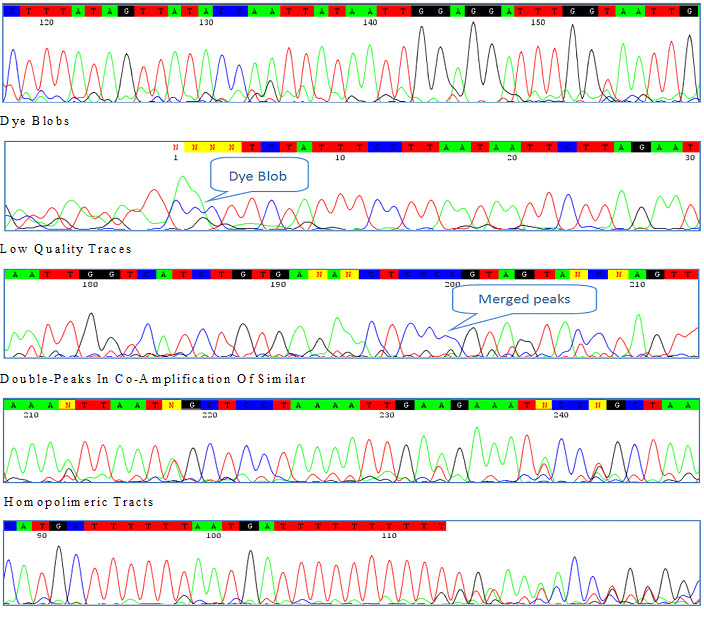 The software chose the following sequences: Tat FOR:5’- ATA AAC CCT GGG AAC CCA TGT GGA –3’ Tat REV: 5’- AAC TTT GGG CTC ATC AAA GTG CCG –3’ These sequences were synthesized and a PCR amplification carried out using the conditions; 5 min. 94o C; 35 x (30 sec. 94o C, 30 sec. 57o C; 30 sec 72o C); 7 min. 72o C.